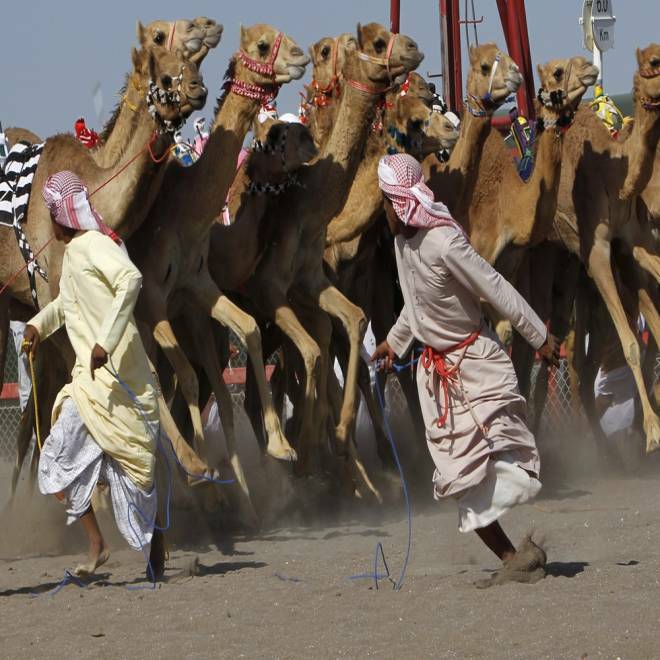 Trainers run in front of their camels at the start of the annual camel race south of Muscat, the capital of Oman. Touring marquee cities and well-trodden tourist sites has its charm, but some of the most magical travel moments can happen when you discover the hidden gems of the world -- spots that fly under the radar of the average traveler. They don't frequently appear in the pages of travel magazines, nor are they necessarily scrawled on travelers' bucket lists. But maybe they should be. Read on to see nine underrated destinations around the world. Peruse any news articles about Colombia over the past few decades, and they'll be riddled with civil conflict, drug cartels, kidnappings and terrorist attacks. This isn't the case anymore. Colombia has quieted down, and the country is safer for travelers. That means its lush rain forests, modern cities and gorgeous beaches on the Caribbean Sea are open for business. Don't miss bustling Bogota, with its lively markets and nightlife, or Cartagena, which is filled with some of the best Spanish colonial architecture in the world. Have you ever heard anyone say "I'm going on vacation to South Korea?" With the exception of those with family connections to the Asian nation (or gawkers who trek to the DMZ to lay eyes on North Korea), we haven't. You could spend weeks exploring the country and never hear a lick of English spoken. South Korea is wonderfully complex, with technologically savvy cities like Seoul, fascinating historic destinations like Gyeongju (nicknamed "the museum without walls" -- the temples alone are worth a visit) and pristine volcanic landscapes that you practically have all to yourself. The Middle Eastern sultanate of Oman for a long time has had a reputation as an isolated desert locale that held little appeal for even the most rugged independent traveler. But a recently built network of paved roads and well-maintained mountain tracks has made the Arabian peninsula nation more accessible. Ruins and castles dot the landscape, and cities are colorful with markets and souqs. At heart Oman is a nature lover's destination that includes the Grand Canyon-like Jebel Akhdar Mountains, Wahiba Sands Desert and beaches that are nesting sites for green turtles. Valley of Fire State Park, Nev. The Grand Canyon tends to be the go-to side destination for a trip from Las Vegas. But it takes five hours or more to drive there, making it a difficult day trip. To get your nature fix without the long trek, head instead to Valley of Fire, which is just 60 miles from Sin City. Taking its name from the millions-of-years-old sculpted red sandstone formations, Nevada's oldest and largest park is a great place to hike, view ancient rock art, search for desert ecosystem wildlife and see an explosion of wildflowers bloom in the spring. More than 11 million visitors go to Singapore annually, but very few of them are Americans (unless they're on a cruise ship and making a day-long port call). That's a pity, because Singapore stands out as a cultural, commercial and culinary gem in the heart of Asia. The shopping is the best in Southeast Asia. Food takes on the influences of a half-dozen or more ethnicities (Chinese, Indian, Malay and more). The botanical garden is among the top in the world. And we have to admit, we like how immaculate it is too -- there's no graffiti or litter, public transportation is impeccably on time and crime is non-existent. Forget the notion that Pittsburgh is a gritty, steel industry town. The city has reinvented itself with a vibrant arts scene, cool outdoor spaces and unique festivals. In fact, National Geographic Traveler magazine rated it among the top must-see places in the world for 2012. Our favorite spots include the Andy Warhol Museum (the artist was born here), Phipps Conservatory and a ride on a historical funicular called the Monongahela Incline. And while the city's most noteworthy contribution to the culinary world has been to slap French fries atop supersized salads, Pittsburgh is becoming a foodie town, with upscale restaurants in the downtown Strip District and a wealth of ethnic eateries sprinkled around town. Wedged between Turkey and Azerbaijan, Armenia is so far off the beaten path of Western travelers that it's seldom visited. In fact, the only tourists who tend to go are those making pilgrimages to commemorate the republic's tragic 20th-century history (civil war, famine, brutal state-sponsored genocide). Yet as an emerging democracy, Armenia has blossomed. The city of Yerevan possesses Mediterranean finesse -- with pretty plazas, hopping cafes and fashionistas strolling down the main boulevards. Elsewhere in the country, burgeoning businesses and a thriving arts scene contrast nicely with ancient monasteries and churches, villages speckled with gingerbread houses and cave dwellings near gorges. If Machu Picchu -- one of the most famous archeological sites in the world -- had remained undiscovered, people would still flock to Peru to see another site, Chan Chan. Unfortunately, it continues to be overshadowed by the famed Lost City of the Incas. Estimated to have once housed 30,000 people of the Chimor civilization from A.D. 850 until 1470, the massive adobe city sits on 12 square miles along the Peruvian coast near the city of Trujillo, and is the largest pre-Columbian city in South America. Intricate carvings of birds, turtles and fish adorn the walls of this UNESCO World Heritage Site, which is threatened by erosion. So it's not only underrated, but it's also slowly disappearing. The southern African republic of Zambia tends to attracts tourists because of Victoria Falls, the largest waterfall in the world. Travelers then move on to other African countries -- Tanzania to the north, for example -- to go on safari. But Zambia is a worthy safari destination in and of itself, and without the crowds that gravitate to other, better-known wildlife-viewing spots. Reserves comprise more than half of the country, with the primal forests of the Luangwa Valley and floodplains of Kafue National Park popular for wildlife viewing. Kafue, in fact, has some of the greatest diversity of animals of all national parks in Africa, with cheetahs, wildebeests, wild dogs and other species. And a bonus: Unlike in many other African countries, walking safaris are permitted here.